On the banks of the Pomeroon River Dutch colonists from Zeeland established a trading post in 1581. This trading post was destroyed by local Indians and Spaniards around 1596. The colonists fled with their commander Joost van der Hooge to an island on the Essequibo River, and started the new Essequibo colony there. A new, and more serious colonization attempt began 1650, when under the command of the Dutch West India Company, plantations were set up on which African slaves were forced to work. A small town called Nieuw Middelburg was formed, and the fortress Nova Zeelandia was built to protect the small colony. French privateers were a serious menace to the small colony. The French visited the colony in 1689 and destroyed it completely, the buildings and sugar-mills were burned and the slaves were taken away to French colonies. The plantations were not restored, and the colony was abandoned. By the end of the 18th century planters started developing plantations again on the banks of the Pomeroon. Now the Pomeroon was part of the Dutch colony Essequibo and Demerara. In 1796 the British conquered the colony Essequibo and Demerara, because the Netherlands had become allies of France. At the Peace treaty of Amiens the colony was returned to the Dutch but it was reclaimed by the British within a year. At the London Convention of 1814 it was decided that Essequibo and Demerara (the Pomeroon River included) and Berbice had to be ceded to the United Kingdom, and they were made part of British Guiana in 1831. The Pomeroon colony in 1688, one year before its destruction by French privateers. 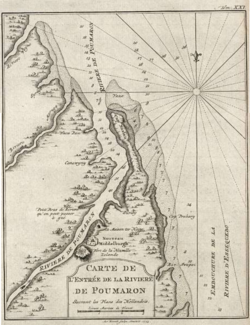 Map of Essequibo and Demerara in 1798. To the left one can see that the colonization of the Pomeroon river had resumed. This page was last modified on 7 July 2015, at 06:20.